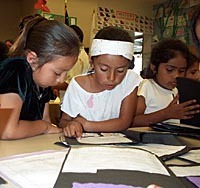 The CCWP provides outreach to improve literacy in local schools such as Watsonville's Ann Soldo Elementary. The Central California Writing Project (CCWP) at UC Santa Cruz will present the third annual "Writing Matters" conference-a symposium on literacy, equity, and social justice-on Saturday, March 24, from 9 a.m. to 3 p.m. at UCSC's Oakes College. The event is designed for K-12 teachers and school administrators in the Monterey Bay Area, as well as college and university students on their way to becoming professional educators. It will offer a wide variety of "best practices" workshops featuring instructional strategies and roundtable discussions on the teaching of writing, plus numerous networking opportunities and teaching resources. "If you're a teacher of English-language learners, this symposium will give you new ideas and strategies to bring back to the classroom, as well as introduce you to the CCWP-a network of teachers dedicated to improving literacy in our schools," noted UCSC's CCWP codirector Susan Freeman. "We want to let community educators know that there's an organization at a UC campus that is very committed to providing outreach in public schools to support the teaching of writing." The CCWP at UCSC has worked with teachers, schools, and districts in Santa Cruz, San Benito, and Monterey Counties since 1977. It is one of 17 California Writing Project sites and an affiliate of the National Writing Project, a network of sites located in universities across the country. The UCSC site provides professional development, resources, and technical assistance through workshops, conferences, young writers camps, summer institutes, and partnerships with local schools. Freeman said the "Writing Matters" conference would include workshops on strategies to help all students write well, particularly immigrant students and English learners. Workshops will examine issues of equity and access in the teaching of writing and include sessions on expository writing, using collage to develop vocabulary and comprehension, digital storytelling and the integration of technology into writing, poetry, and the use of the Socratic Seminar with high school students to spark critical thinking and writing in the classroom. Freeman added that the CCWP will also partner with Pisces Moon Productions, a youth theater group in Santa Cruz, for a roundtable discussion at the symposium. "Their session will focus on the impact that writing, literature, and theater can have on students' understanding of controversial issues in the world and their ability to connect those issues to their own lives," Freeman said. Andy Shapiro, a CCWP teacher at Main Street School in Soquel, will additionally be inviting symposium participants to join him in a dialogue about teachers writing in the public forum. 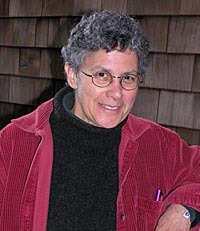 Shapiro writes the weekly education column, "It Takes A Village," for the Santa Cruz Sentinel. "It will be a roundtable discussion of the importance of teachers writing about their own lives and what happens in the classroom," Freeman noted. "It's about how teachers can become writers-and a public voice in the discussion of education." Registration for the "Writing Matters" conference is $40 through March 18 or $50 at the door. Students receive a discount at $25. For more information, call the CCWP at UC Santa Cruz, (831) 459-4506, or contact Carol Artman at cartman@ucsc.edu. Registration forms are also available at the CCWP web site, (follow the links to Writing Matters).